A great many silent films that were almost impossible to see when David and I were in graduate school are now available on DVD. And it’s not just a matter of titles becoming available. In those days we might be able to see a classic film, but it was likely to be a shortened, fuzzy version made from a worn distribution print. Now government support for film archives and revenues from home video have promoted many more restorations. There are still companies releasing poor-quality DVDs of silent films, but beautiful prints, complete with tinting, toning, hand-coloring, and specially composed musical tracks, as well as supplementary material, are becoming more common. 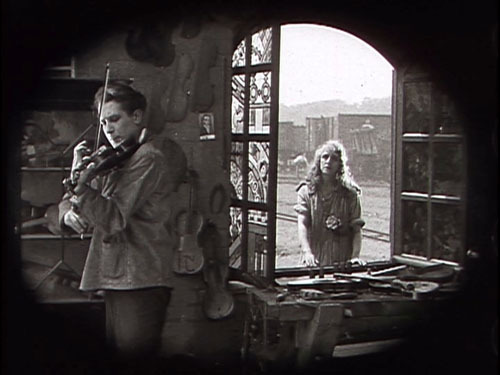 A case in point is the new DVD version of Abel Gance’s 1922 epic, La roue (“The Wheel”), which the enterprising company Flicker Alley released last year. In its short existence since 2002, Flicker Alley has done exciting work. Its recent “A Modern Musketeer” collection finally makes a selection of Douglas Fairbanks’ pre-swashbuckler comedies and dramas available. I personally prefer these lively, witty, imaginative films to Fairbanks’ 1920s costume pictures. Flicker Alley’s George Méliès set is one of the great achievements of DVD production and deservedly won last year’s prize for the best silent DVD set at Il Cinema Ritrovato. Other highlights include F. W. Murnau’s rare psychological drama Phantom (1922) and Louis Feuillade’s serial, Judex (1917). I wrote about Flicker Alley’s release of Discovering Cinema, on early sound and color. David and I first saw La roue in 1973, in a 16mm print at George Eastman House. It lasted around two hours projected at sound speed. We had another chance to see it at a 1979 screening of a 35mm nitrate print at the Museum of Modern Art. Again, it was a truncated version. In short, you had to see La roue at an archive. The original 32-reel version would have run between seven and eight hours. That doesn’t survive, but versions longer than the ones we had seen survived in various collections. A more common release version made in the 1920s reduced the film to 12 reels, or about three hours. Other still shorter versions also circulated. Flicker Alley’s version is none of these. The liner notes say that it’s 20 reels, and it runs about 260 minutes. (The total time given on the box is 270 minutes, which I assume includes an eight-minute making-of supplement.) So what we have here is not an approximation of one of the release prints, but an attempt to reassemble as much footage as possible. La Roue was originally shown in France over three days, in 32 reels, with a running time of almost eight hours, but was soon shortened to 12 reels, the maximum length for a typical feature film at the time. This new restoration, produced by Eric Lange, David Shepard and Jeff Masino with invaluable support from Turner Classic Movies, began with a 35mm master positive of this 12-reel version, a Russian print of an 8-reel version, two incomplete tinted nitrate prints of a longer French version, and finally, for two short but critical scenes, a 4-reel abridged version released by Pathe on 9.5mm for home movie screening. Conflating all of this material, the Lobster Film Studios restoration team headed by Eric Lange was able to prepare and digitally restore a 20-reel version, by far the most complete edition of La Roue seen anywhere since 1923. This release possesses exceptional pictorial quality and English titles that use the type font and moving photographic backgrounds of the original film. The notes call this restoration “the fullest presentation of La Roue to reach the public since 1923,” which may or may not be true. I have seen a print of La roue of roughly the same length which has a significant number of scenes that aren’t present in the Flicker Alley release-and lacks several of the scenes included here. That was at the Royal Film Archive of Belgium, though they don’t hold the original material on it; that’s in a French archive. That version runs 287 minutes at 18 frames per second; I can’t find an indication of projection speed on the DVD, though I would guess that it’s comparable. I definitely don’t want to suggest that the Flicker Alley DVD is not worth buying or viewing. Quite the contrary, it’s a valuable release of an extremely influential and important film. Perhaps a longer version will eventually be assembled, but I doubt that will happen any time soon. Those who have been waiting for years to see La roue should pounce on this, and it’s ideal for instructors who want to show clips of highly influential sequences in classes. The visual quality of the print is mostly excellent, apart from a few passages where the restorers had to use a 9.5 mm print to fill in a few scenes–and even those look pretty good. 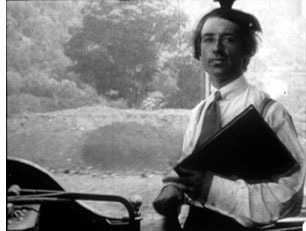 Blue tinting is used in the night scenes, and the film is accompanied by Robert Israel’s effective score. Gance has many ardent admirers, to judge by the effusive reviews of the DVD on Amazon. But I find his major silent features a maddening blend of exciting stylistic innovation and old-fashioned, maudlin storytelling. La roue was, as far as we know, the first film to use rapid, rhythmic editing, at times going down to single-frame images. It’s also full of the subjective camera techniques typical of French Impressionist filmmaking: out-of-focus shots, white masks, superimpositions, and so on. The plot, however, is simple and melodramatic; it centers on Sisif, a train engineer, and his secret adopting of a little girl who survives a train wreck in the opening scene. Norma grows up assuming herself to be his daughter, and Sisif’s son Elie, a sensitive violin-maker, believes her to be his sister. Sisif falls in love with her but stifles his feelings, giving her in marriage to a rich man whom she doesn’t love. When Elie learns the truth, he comes to love her as well but also hides his secret. A great deal of suffering ensues, over which Gance lingers lovingly with many shots of agonized faces. Most famous are three scenes. 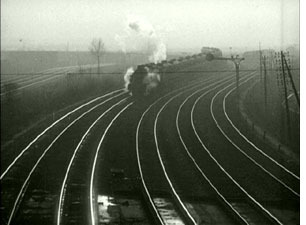 The film’s action begins dramatically with the train crash, vividly rendered in many fairly quick shots. In the second, Sisif decides to crash the train in which Norma is traveling to her marriage. Even faster, accelerating editing conveys both Sisif’s anguish and Norma’s growing alarm. It’s a bold and suspenseful scene, and required viewing for anyone interested in silent cinema and the history of film style. The second passage comes after a fight between Elie and Norma’s husband that ends with Elie dangling from a tree root over a cliff. As he hears Norma approaching in an attempt to save him, their life together literally flashes before his eyes in a series of shorter and shorter shots that end with a flurry of single-frame images that end with his fall. Much of the imagery is also beautiful, in particular the shots of trains passing sinuously along rails, a motif that punctuates the film. These innovative scenes and other flashy techniques tended to be retained as distributors cut out more and more footage. What got trimmed seems to have been details of the quadruple romance plot. Scenes in the Belgian print that aren’t on the DVD include two brief ones indicating that the husband’s fortunes are declining. This sets up for the moment when Norma is revealed to have been left destitute after his death, a development that comes abruptly in the DVD version. The Belgian print also contains a rather silly scene in which Sisif talks to his train engine and imagines it replying to him. 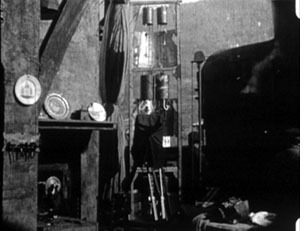 Modern viewers may find it a bit disconcerting that the interior scenes of Sisif’s small house, built between the rails in a real train-yard, are lit with bright sunlight. 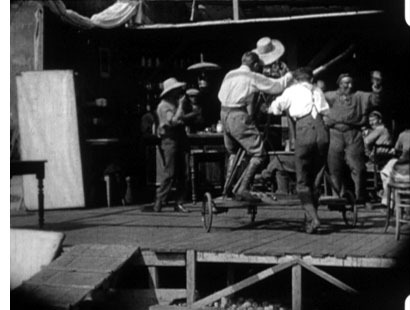 Immediately after World War I the French film industry was short on studios and lighting equipment. Using open-air sets and full sunlight was not uncommon there or in countries with small film industries. Most films of this era did not have making-of documentaries. In this case, though, poet Blaise Cendrars, a great cinema enthusiast, filmed some scenes of Gance and his team at work and put together a fascinating short. A couple of shots show the camera used to film the tavern scene mounted on a dolly. One view reveals just how close to the rails the sets for Sisif’s house were built. Trains passed so close to them that someone had to be stationed nearby to warn the crew of oncoming trains. 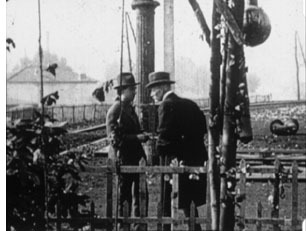 Cendrars also recorded a visit Charles Pathé paid to the location, and there’s a heroic view of the director in the cab of a moving locomotive. This film has hitherto been très rare, so we are lucky to have it now. The booklet accompanying the discs has an excellent essay on the history of the production by William M. Drew and notes by Israel on his score. David insisted on having the photo at the bottom included among the illustrations. Gance appeared at the Walker Art Center in Minneapolis when he was 91 years old, which means that must have been in 1980. 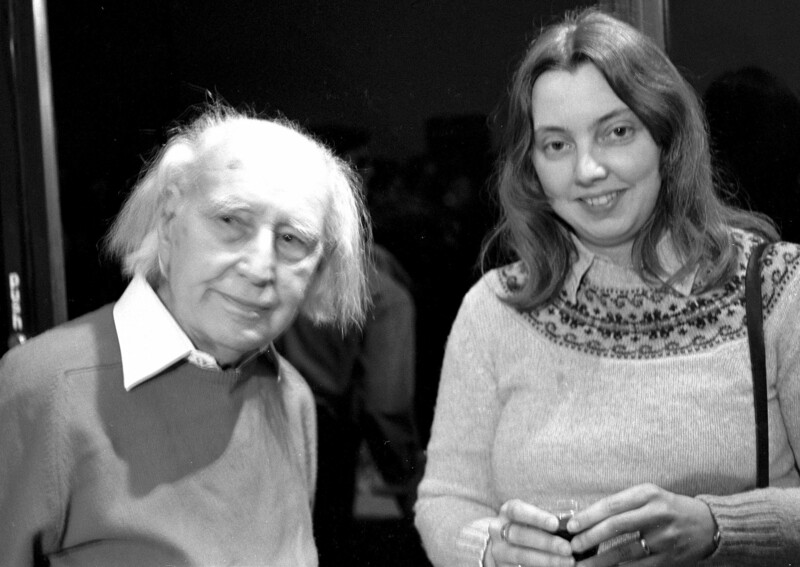 He had come to introduce a screening of Bonaparte and the Revolution, an early attempt to restore Napoléon vu par Abel Gance. At a reception afterwards, M. Gance was gracious enough to inscribe a photo and our copy of a book he had published in the 1920s, purchased back in the days when one could still find such things fairly readily in Parisian used bookshops. He also let David take a picture of him and me. He died the following year. Note: Filmmaker and blogger Kevin Lee has created two more of his “Shooting Down Pictures” video analyses, with me speaking about La roue (five minutes) and Variety (six minutes) to clips Kevin has edited. This entry was posted on Wednesday | February 18, 2009 at 10:28 am	and is filed under Experimental film, Film archives, Film comments, Film technique, Silent film. Responses are currently closed, but you can trackback from your own site.